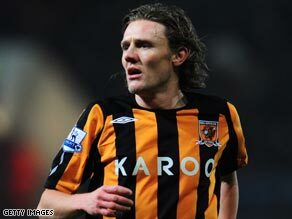 (CNN) -- Hull City's record signing Jimmy Bullard has been ruled out for the rest of the season following knee surgery. Bullard was injured on his full debut for Hull City against West Ham last month. The 30-year-old joined the Premier League new boys in a £5million transfer from Fulham last month but injured his knee during his debut against West Ham. The bad news was confirmed by a Hull club statement on Thursday. "Jimmy Bullard underwent a procedure last night in America to repair a torn cartilage. Whilst performing the arthroscopy, the surgeon noticed fresh damage to his anterior cruciate ligament. "It was decided to undertake a reconstruction of the damaged ligament which means that Jimmy will be unavailable for the rest of the season." It is not the first time Bullard has been forced out with a knee problem. He spent 16 months on the sidelines after sustaining a knee injury playing for Fulham in September 2006. But the midfielder made a superb return to action to finish last season in fine form as Fulham avoided the drop to the Championship. Further fine performances earned him a call up to Fabio Capello's England squad before his surprise move to Hull in the January transfer window. Bullard made the switch after talks over a new deal with Fulham broke down and was recruited by the Tigers to shore up their bid to stay in the Premier League. After a fine start to their campaign, Hull have slipped down the table and are now just six points above the relegation zone.